Circassia is annexed into Russia. 150,000 – 200,000. 20,000 regulars. An unknown number of indigenous Caucasians killed during deportation. About 500,000 indigenous highland Caucasians were expelled mainly to the Ottoman Empire, and a much smaller number to Persia. 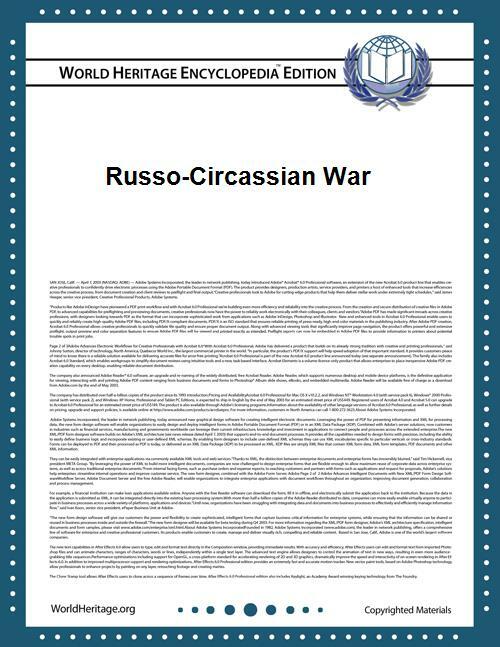 The Russo-Circassian War (1763–1864) refers to a series of battles and wars in Circassia, the northwestern part of the Caucasus, which were part of the Russian Empire's conquest of the Caucasus lasting approximately 101 years, starting under the reign of Tsar Peter the Great and being completed in 1864. Although the conquest of the Caucasus started at least as early as the Russo-Persian Wars, the term Caucasian War commonly refers only to the period 1817–1864. Those who use the term Russian–Circassian War take its starting date as 1763, when the Russians began establishing forts, including at Mozdok, to be used as springboards for conquest. The Caucasian War ended with the signing of loyalty oaths by Circassian leaders on 2 June [O.S. 21 May] 1864. Afterwards, the Ottoman Empire offered to harbour the Circassians that did not wish to accept the rule of a Christian monarch, and many emigrated to Anatolia, the heart of the Ottoman Empire and ended up in modern Turkey, Syria, Jordan, Palestine, Iraq and Kosovo. Different smaller numbers ended up in neighbouring Persia. Various Russian, Caucasus, and Western historians agree on the figure of ca. 500,000 inhabitants of the highland Caucasus being deported by Russia in the 1860s. A large fraction of them died in transit from disease. Some of those that remained loyal to Russia, were settled into the lowlands, the left-bank of the Kuban River. Circassia (Cherkessia in Russian) refers to a region the majority of whose inhabitants before the 1860s were the Adygey (Adyghey, Adyghe) ethnic group, known to the West as Circassians. This region consisted for the most part of the region between the westward flowing Kuban River to the north and the Caucasus mountain range to the south, although the Kuban River constituted only part of the northern boundary. The Circassians were never politically united for a long period. The western bulk of Circassia, they belonged to any of about ten tribes, living in communities headed by chieftains. In the east of Circassia were two feudal polities, Greater Kabardá and Lesser Kabardá. In the late 1550s, the ruler of one of the Kabardás, Temryuk (or Temriuk), struck a politico-military alliance with Tsar Ivan IV of Russia ("Ivan the Terrible"), for mutual assistance against expansionist attacks by the Persian and Ottoman Empires. In this period of history, the Circassians were Christians; Islam did not begin to penetrate Circassia until the following century. In the 1560s Ivan and Temryuk directed forts to be constructed, including Tumnev at the western end of Circassian lands and along the upper reaches of the Sunzha river, at the eastern end of Circassian lands. During the mid 18th century, the Circassian region was a key strategic location to the power struggle between the surging British and French empires, the emerging Russian Empire, and the declining Ottoman Empire. Russia had set its sights on expansion along the Black Sea, while Britain and France sought to reduce Russia's ability to take advantage of the declining Ottoman Empire, a foreign policy known as the answer to the Eastern Question. Peter the Great's plans for expansion into India and the Black Sea included engaging both Turkey and Persia. To facilitate the fall of Persia, Russia would require shipyards on the Black Sea, which made Circassia, with its coastline, a target. On a number of occasions, the Russian army took advantage of unrest and difficulty both within and between the Persian potentates, illustrated on 22 June 1806 when – during the Russo-Persian War (1804-1813) – the Caspian Sea town of Derbend fell to the Russian forces without a shot being fired. The ruler of Derbend, Shaykh Ali, was so unpopular with his people that upon the arrival of the Russian army, they revolted and allowed the Russians to take over. In 1804, the subjugated Kabardians, as well as the remaining Western Circassians and neighbouring Balkars, Karachays, Abazins, Ossetins, Ingushes, and Chechens, united in a military uprising. The rebels demanded the destruction of the Kislovodsk Russian fort and of the Cordon line. This was one of three defensive lines, all of which consisted of chains of forts, which were built during the whole conflict: the Caucasian line in 1780, the Chernomorski Cordon line in 1793, and the Sunja line in 1817. With the refusal of these demands, and despite threats of bloodshed from Russian commander, General Pavel Tsitsianov, the rebel forces began threatening the Kislovodsk fort. Kabardian forces pushed Russian forces commanded by General Glazenap back to Georgievsk and then besieged them, but the attackers were in turn eventually pushed back, and 80 Kabardian villages were torched as a reprisal. In October 1809, rebel forces attacked the Caucasian Line. Between 1809 and 1810, Russian reinforcements began arresting Kabardian princes for resisting colonial rule, which led many of the princes to submit to Russian control and some resistance forces to abandon the war. In 1810, a Russian army under General Bulgakov destroyed 200 Circassian and Balkar villages and drove away 20,000 cattle. In 1811, petitions were sent to St. Petersburg in Russia, appealing for the rights of Kabardian aristocrats in the occupied areas. While many other points were quickly agreed to, requests for the return of land occupied by Russian fortresses were deliberated over. Russia encouraged the loyalty of defeated Kabardian nobles with donations to the Circassian government and honorary military ranks for the aristocracy in the Russian army. Following the successes in the Russo-Persian War (1804-1813) and the resulting Treaty of Gulistan, Russia enabled itself to use a much larger portion of its army in this conflict in another part of the Caucasus. Meanwhile, on the military front, Russian forces in the Circassian region were consolidated into a new Caucasian corps in 1816 under the command of newly arrived General Aleksey Yermolov who just returned from service in the war of 1804-1813 against Persia. In May 1818, the village of Tramov was surrounded, burnt, and its inhabitants killed by Russian forces under the command of General Delpotso, who took orders from Yermolov and who then wrote to the rebel forces: “This time, I am limiting myself on this. In the future, I will have no mercy for the guilty brigands; their villages will be destroyed, properties taken, wives and children will be slaughtered." The Russians also constructed several more fortifications during that year. Military forces were sent into Kabardia, killing cattle and causing large numbers of inhabitants to flee into the mountains, with the land these inhabitants had once lived on being acquired for the Kuban Cossacks. The entirety of Kabardia (eastern Circassia) was now declared Russian territory. Yermolov accelerated his efforts, with the month of March 1822 alone seeing fourteen Kabardian villages being displaced as Yermolov led expeditions into western Circassia. The construction of new defensive lines in Kabardia led to renewed uprisings, which were eventually crushed. To discourage further uprisings, the Russians granted freedom to the serfs of the lords who had led the latest uprisings. Circassia was placed under Russian military rule in 1822, with a Temporary Kabardian Court also being established. Painting of A.A.Kozlov, depicting feat of soldier Osipov, sacrificing themselves by leaping into a powder keg with the fire, during a Circassin massacre of a Russian Military Fort. Minor Kabardia, or western Circassia, was targeted for a new offensive by General Stal, who was given command of the Caucasian Line in 1819. 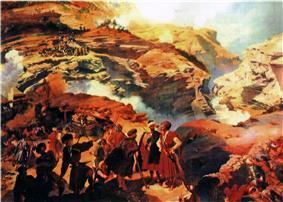 In September 1820, Stal and his forces began to forcibly resettle inhabitants of western Circassia. Throughout the conflict, Russia had employed a tactic of divide and rule, and following this, Yermolov instructed Stal on 1 July 1821 to encourage the Ingushes and Taugur tribes, who had previously been subjugated by the Circassians, to rise up and join the Russian efforts. While eastern Circassia was being occupied, Russia was also engaged in a war with the Turks to free the Black Sea coastline from Turkish control, and sporadic wars had also flared up with other neighbours, including the Chechens. In western Circassia, a number of tribes were dominant; the Besleneys, Abadzekhs, Ubykhs, Shapsughs, and Natkhuagias. The first of these were particularly involved in raiding Russian outposts in former eastern Circassia, or Kabardia. These raids continued for several years, while the Russians continued to fortify their position; constructing the Labinski defensive front in 1840, and beginning to develop a new form of scout, known as a plastun, for scouting Circassian held territory beyond such defensive positions. Russian and Circassian forces clashed repeatedly, particularly on the Kuban plains, where cavalry from both sides could manoeuvre freely. Trade with Circassia could not be prevented, however, and both the Turks and the British supplied Circassia with firearms and ammunition with which to fight the Russians. Britain also supplied several advisors, while Turkey attempted to persuade Circassia to start a Holy War, which would draw support from other nations. In 1836, the Russian navy captured a British merchant ship supplying ammunition to the Circassians. 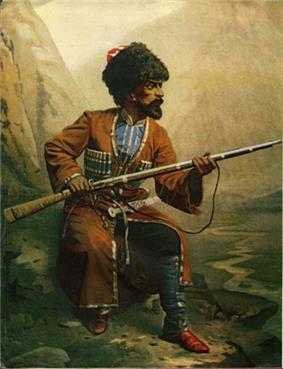 Kazbech Tuguzhoko, Circassian resistance leader. At this time, the current Russian Tsar, Nicholas I, ordered construction to begin on the coastline, by building fortresses at every point on the captured Black Sea coast that was able to accommodate Russian naval vessels. Cape Adler was one of these locations. 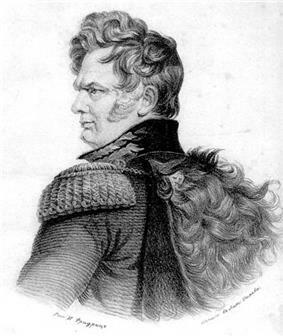 On 3 June 1837, Russian naval forces under the command Rear-Admiral Esmont, with troops commanded by General Volkhovski, began to head towards Cape Adler, arriving on 6 June. A Russian commander, Baron Rosen, sent a scout ship to locate a place for landing, but it was driven back by Circassian defenders. On 7 June 1837, General Volkhovski landed at Cape Adler and entered a nearby forest, through which Circassian defenders had retreated after being bombarded by the Russian ships. 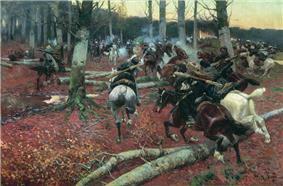 In the dense forest, however, the Circassian defenders quietly approached the Russian positions and attacked. They were driven back, but the pursuing Russian forces ran into more Circassian defenders, and the messengers sent back for instructions were found by Circassian parties and killed. The Russians were then engaged in hand-to-hand combat with their enemy, and only after the late arrival of reinforcements managed to push the Circassians back and secure Cape Adler. Later that year, Nicholas I visited the area to see the situation for himself. On 13 April 1838, Russian forces engaged the Circassian army in the estuary of River Sochi, and on 12 May 1838 the Russians landed at Tuapse. The majority of engagements during this part of the conflict took place in the form of either amphibious landings on coastal towns in accordance with the Tsar's directive to secure possible ports, or by routing out Circassian forces entrenched in mountain strongholds. At Tuapse, one of the fiercest battles of the conflict, the Russian landing had begun at 10:00 in the morning, and the Circassians were not beaten back from their positions until 5:00 in the afternoon, with the Russians suffering heavy casualties. On the following day, 13 May, when arriving to request permission to remove their dead from the battlefield, the Circassians were lectured on the benefits of staying under Russian control by the Russian commanders, Colonel Olshevski and Lieutenant Colonel Baron Grach. Later that year, the Russian Tsarevich Alexander III visited the Russian forces. The fall of Gunib and capture of Imam Shamil (or Schamyl), a rebel religious leader, by Dmitry Milyutin in 1859, marked the final conquest of the eastern part of the North Caucasus (specifically, of Chechnya and Dagestan). This freed the Russian forces that had fought there to join the hostilities in Circassia. Between 1856 and 1859, two defensive lines were built to contain the remaining hostile tribes, the Adagumski Line and the Belorechenski Line. In May 1859, elders from the Bjedughs negotiated a peace with Russia and submitted to the Tsar, with the oath of loyalty to the Tsar being taken at assembly points beyond the Kuban River. The surviving Circassian leaders saw little chance in resisting against the economic and military superiority of Russia. Many of the remaining tribes soon submitted to the Russians, including the Abadzekhs on 20 November 1859. The remaining Ubykhs were killed or forced to flee into the Ottoman Empire. The Caucasian War, which had grown out of the Russian–Circassian War, ended on 2 June 1864 (21 May 1864 (O.S. )), in Kbaada, a village populated by the Akhchipsou tribe of Abazins, as declared by the Tsar's manifesto. Grand Duke Michael Alexandrovich of Russia, overall commander of Russian forces in the region, recognized this as the "conquest of the Western Caucasus and the end of the Caucasian War." In 1857, Dmitry Milyutin first published the idea of mass expulsions of Circassian natives. Miliutin argued that the goal was not to simply move them so that their land could be settled by productive farmers, but rather that "eliminating the Circassians was to be an end in itself - to cleanse the land of hostile elements". Tsar Alexander II endorsed the plans, and Milyutin later would become the minister of war in 1861, and from the early 1860s expulsions began occurring in the Caucasus (first in the Northeast and then in the Northwest). Toward the end of the conflict, the Russian General Yevdokimov was tasked with driving the remaining Circassian inhabitants out of the region, primarily into the Ottoman Empire. This policy was enforced by mobile columns of Russian riflemen and Cossack cavalry. "In a series of sweeping military campaigns lasting from 1860 to 1864 . . . the northwest Caucasus and the Black Sea coast were virtually emptied of Muslim villagers. Columns of the displaced were marched either to the Kuban [River] plains or toward the coast for transport to the Ottoman Empire . . . . One after another, entire Circassian tribal groups were dispersed, resettled, or killed en masse" Such tactics had been in use for a number of years. Count Leo Tolstoy, the future author of War and Peace, saw action in the war in 1850–51. He described how "It had been the custom to rush the auls [mountain villages] by night, when, taken by surprise, the women and children had no time to escape, and the horrors that ensued under the cover of darkness when the Russian soldiers made their way by twos and threes into the houses were such as no official narrator dared describe" Similar atrocities committed in the final campaign of 1859–1864 were recorded by contemporary Russian observers and British consuls. 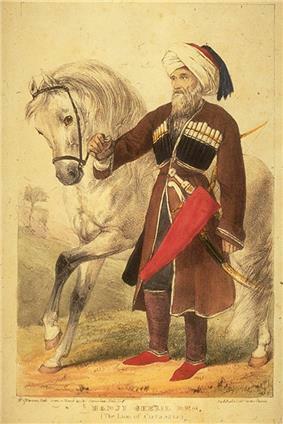 A consul Dickson recounted in an 1864 dispatch: "A Russian detachment having captured the village of Toobah on the Soobashi river, inhabited by about a hundred Abadzekh [a tribe of Circassians], and after these had surrendered themselves prisoners, they were all massacred by the Russian Troops. Among the victims were two women in an advanced state of pregnancy and five children. The detachment in question belongs to Count Evdokimoff's Army, and is said to have advanced from the Pshish valley. As the Russian troops gain ground on the [Black Sea] Coast, the natives are not allowed to remain there on any terms, but are compelled either to transfer themselves to the plains of the Kouban or emigrate to Turkey". Circassians have attempted to attract global media attention to the Circassian Genocide and its relation to the city of Sochi (where the Olympics will be held in 2014, on the official anniversary of the genocide) by holding mass protests in Vancouver, Istanbul and New York during the 2010 Vancouver Winter Olympics. On October 2006, the Adyghe (Circassian) organizations of many countries in North America, Europe and the Middle East sent the president of the European Parliament a letter requesting recognition of the genocide. According to historians who support the concept of a Circassian genocide, 90 percent of people with Circassian descent now live in other countries, primarily in Turkey, Jordan and other countries of the friction between the two ethnic groups and the resulting War in Abkhazia. ^ a b Henze 1992. ^ a b Karpat 1985. ^ King, The Ghost of Freedom, p73-76. Quotes: p74:"The hills, forests and uptown villages where highland horsemen were most at home were cleared, rearranged or destroyed... to shift the advantage to the regular army of the empire."... p75:"Into these spaces Russian settlers could be moved or "pacified" highlanders resettled." ^ a b c d King, Charles. The Ghost of Freedom: A History of the Caucasus. Page 94. In a policy memorandum in of 1857, Dmitri Miliutin, chief-of-staff to Bariatinskii, summarized the new thinking on dealing with the northwestern highlanders. The idea, Miliutin argued, was not to clear the highlands and coastal areas of Circassians so that these regions could be settled by productive farmers...[but] Rather, eliminating the Circassians was to be an end in itself - to cleanse the land of hostile elements. Tsar Alexander II formally approved the resettlement plan...Milyutin, who would eventually become minister of war, was to see his plans realized in the early 1860s. ^ a b UNPO 2006. ^ Murat Temirov (3 January 2010). "Fire and Ash Olympics". Adyghe Heku. Retrieved 7 April 2010. ^ Zhemukhov, Sufian (September 2009). "The Circassian Dimension of the 2014 Sochi Olympics". PONARS Policy Memo No. 65 – Georgetown University. Circassian World. Retrieved 28 November 2009. ^ Ferris-Rotman, Amie (21 March 2010). "Russian Olympics clouded by 19th century deaths". Reuters, through Yahoo!News. Retrieved 5 April 2010. ^ a b Dzutsev, Valery (25 March 2010). tt_news=36192&tx_ttnews[backPid]=484&no_cache=1 "Circassians Look to Georgia for International Support"]. Jamestown. Retrieved 5 April 2010. Baddeley, John F. (1908). The Russian conquest of the Caucasus. London: Longmans, Green and Co.
Henze, Paul B. 1992. Circassian resistance to Russia. In Marie Bennigsen Broxup, ed., The North Caucasus Barrier: The Russian Advance Towards The Muslim World. London: C Hurst & Co, 266 pp. (Also New York: St. Martin's Press, 252 pp.) Part of it can be found here. Retrieved 11 March 2007. Karpat, Kemal H. 1985. Ottoman population, 1830–1914 : demographic and social characteristics. Madison, Wis.: University of Wisconsin Press. McCarthy, Justin. 1995. Death and exile: the ethnic cleansing of Ottoman Muslims 1821–1922. Princeton, NJ: Darwin. Chapter 2: Eastern Anatolia and the Caucasus. Khodarkovsky, Michael. 2002. Russia's steppe frontier : the making of a colonial empire, 1500–1800. Bloomington : Indiana University Press. Series: Indiana-Michigan series in Russian and East European studies. Leitzinger, Antero. 2000. The Circassian Genocide. In , 2000 October 2000, Issue 2The Eurasian Politician.